Jon was brought up in East Anglia, which is uniquely rich in late mediaeval churches, as well as being the main stronghold of traditional dulcimer playing in Britain; so we have named our dulcimers after some of his favourite churches. Our dulcimers are modern instruments rather than copies of old East Anglian types, and include influences from many cultures, including Eastern Europe, America and China. least, to realise its full potential. We call our ’flagship’ dulcimer, with its intricate fretwork sound-holes roses, the Melford, after the wonderful church at Long Melford in Suffolk. 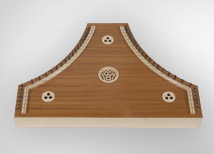 The dulcimer probably originated in Persia, or Iran; where the santur - as it is called - is one of the most popular classical instruments, even today. 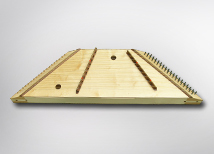 Our small dulcimers, based on modern Iranian santurs, also resemble the early dulcimers used in mediaeval Europe. 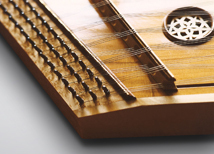 The psaltery differs from its close relative the dulcimer mainly in the method of playing, as the strings are plucked with the fingernails or a plectrum (goose quills were used in mediaeval times) instead of being struck with hammers.